Mahmoud Zeid and his wife Sabah speak fo the day they had to flee their home in July 2015 following an airstrike close to their neighbourhood in Jabal Al Nugm. 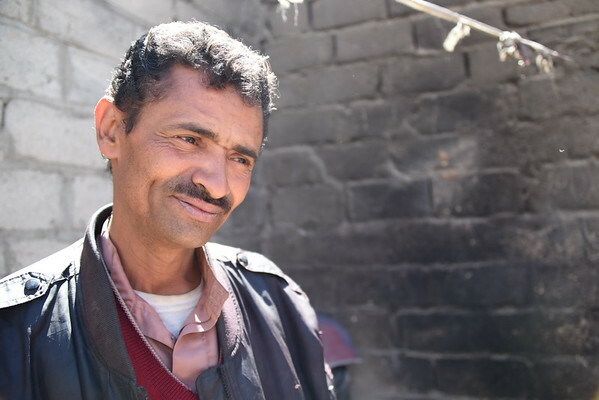 Zeid used to work as a tailor but since the war and blockade started he no longer has a job. Sabah suffers from kidney failure. NRC provides them with food aid in a project funded by WFP. Mahmoud said: "Before the war I worked as a tailor. After the war I lost my job. I spent four months without work, work went down drastically, maybe three or four days and then nothing. This is largely because of the electricity situation and the lack of money in people's pockets, there's no movement, it's as if life stopped. “This is all caused by the war, of course. We have to survive. There is no food, no spending money like there used to be, we get a plate or two of food and get on with it. Even then we don't even have cooking gas. “I was out of the house with my son Mohammed. We were waiting in the queue for cooking gas, there were some 5,000 cylinders waiting to be refilled. At one point I heard a huge explosion in our neighbourhood, but all of Sana'a was being bombed. I was with Mohammed at the gas distribution point and planes were bombing the area. The planes were bombing everywhere. Then we got missiles raining on us, I don't know what they were, Tomahawks? Scud? “Here in Nuqm it was hell. The sky above us was covered with debris and shrapnel and smoke. Everything was up in the sky. It was hell. “My son Mohammad was afraid for his mother. I grabbed him so that we sought cover behind houses. Then we rushed towards home. When we arrived at the foot of the hill to our neighbourhood I let go of our gas cylinder and tried reaching home, but couldn't get through. Everyone was fleeing in a panic, families with children. They fled their houses. Sabha said: "We went on foot. We took nothing with us, we had not time. During the bombing I was exhausted. I told them let's go to the school. We were too afraid. I felt paralysed till we reached the school. When we reached the school we could hear the missiles. We were a lot of people in one classroom. There were missiles and loud explosions. We were afraid. “We came back home (after a few months) and we were happy to be back, one rests when he's back home. But I had a lot of cleaning to do. A lot of repairs, so many things were damaged. There was dust and debris all over the place. Everything was scattered on the floor. Mahmoud said: "Our sewage pipes were destroyed. The windows were gone and we had stones that came in with the blast. This room had a lot of cracks. It was as if the world turned upside down. Our house was damaged by all the blast of the explosions. Our windows were gone, our furniture, the television is gone, the roof has been damaged, all the glass has been broken. We had glass flying from far away into our house. “I have five daughters and one son. In this situation what kind of future can we talk about? A future for children? It's all bleak. It's a black canvas. This blots out the future of millions of children as regards their health, education, nutrition... nutrition affects growth. These problems brought by the violence affect our children. Children are traumatised by this war, how can we speak of the future? If this conflict goes on it's a future of blood and darkness."